The man who heckled Jeremy Corbyn at a Momentum rally on Wednesday evening is a Liberal Democrat activist who stood for the party in last month’s London Assembly elections. Zack Polanski told BuzzFeed News he decided to interrupt the meeting of Corbyn supporters because the Labour leader’s “passivity and ambivalence for Europe” had contributed to Britain voting to leave the EU in last week’s referendum. 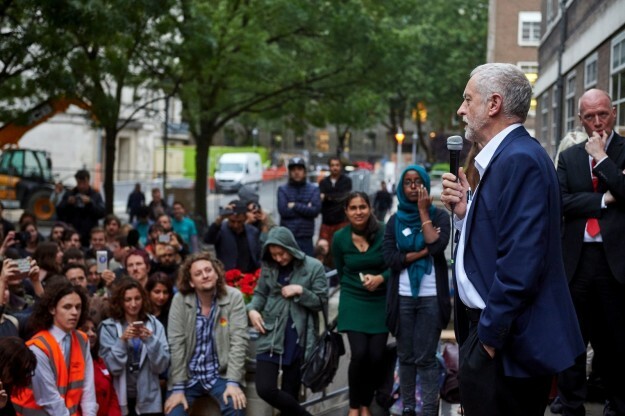 Corbyn responded by telling the crowd to respect the heckler and insisting “let our friend stay”. Despite this, supporters of the Labour leader were unhappy with the media for subsequently focusing on the then-unknown heckler during evening news bulletins. What else do you need to know about a ‘controlled’ media! Only a ‘modelled truth’ that speaks ‘their’ message will pass – and they will be well paid! What Zack Polanski meant to say was that Jeremy was respectful of the wishes of so many who wanted to leave the EU and did not resort to calling them names or lying through his teeth using overstated and inappropriate scaremongering. Instead Zack chose that path – guess who I would rather listen to?